In 1830, Richard Lestrange, a teacher of literature, takes up a post at a girls’ finishing school close to Karnstein Castle, where he develops an infatuation with one of his pupils, the enigmatically beautiful Mircalla, unaware that she is in fact the reincarnation of a notorious local vampire. Giles Barton, one of Lestrange’s fellow teachers who has an interest in the occult, suspects the truth and reveals to Miraclla his fascination to learn more the evil cult to which she belongs. His interference costs him his life and places Lestrange in mortal peril! This film was hit in the pre-production stage by the loss of its original star and director. Peter Cushing, who was to have played the part taken by Ralph Bates, had to pull out because of his wife’s illness; and Jimmy Sangster took over from Terence Fisher, who was incapacitated with a broken leg. Danish actress Yutte Stensgaard had appeared in Amicus’s “Scream and Scream Again” (1969). Despite her announced ambition to win an Oscar, it was not to be and she ended up doing a short stint as a hostess on the ATV game show “The Golden Shot”. Disc Jockey Mike Raven tried the occasional stab at acting. His other roles include the low-budget “Crucible of Terror” (1971). 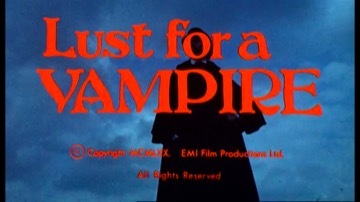 In “Lust for a Vampire”, however, his voice was dubbed by actor Valentine Dyall.